Whew, it's been a while since I've checked into ye olde blog. Usually October-December is the busiest time for my training work, so I'm on the road a bunch, and when I'm not, I'm preparing for training -- freshening up the content, making travel arrangements, ironing out contract details, etc. etc. Sewing fits in the spaces in between. 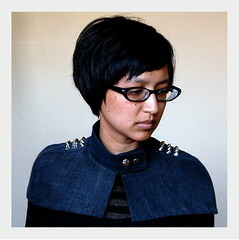 This denim capelet is made from repurposed men's jeans, and the studs are from www.studsandspikes.com (which shipped really quickly and has great customer service, BTW. Highly recommend). I'd like to make the capelet to order in the Vocabulary shop but won't list it until November, when I have any hope of filling orders. It took me a couple of weeks after the snaps went on the capelet to dress up and take photos. We had rain for a few days so lighting wasn't conducive, and then it got so hot that I was wearing short dresses for a few days (not dark mystery studded capelet kind of weather, you know), and the day I finally took pics I saw that Tina had just posted a capelet on her glam.spoon blog! We had never even uttered the word "capelet" to each other and there we were, with our individual interpretations that looked so different! We traded messaged about it, and she commented that my capelet was like the tomboyish little sister to her luxe cashmere version. And it probably echoes who we would be in person with each other! So fun. Love ya, girl. The funny thing is that I tweeted a hilarious quote about Tibet from one of the contestants, and today The Tyra Banks Show started following my tweets! I totally need some modeling lessons, so maybe Tyra will take up this lost cause I am and bestow upon me some personalized supermodel tips. Ha! *grin* I can really see you jumping on the bed, waving with the magazine, in your pj's. Funny! I hope the smoke disappeared and that you were able to get some sleep later on. I love how structured and tailored this is! It would be really fun to play with layering it over other outfits. Oh, that is cute! I love that punkish military vibe it gives your outfit. That's scary about the heater--I hope it's worked out its issues now! I love it. So perfectly you. Whoa. That's a bit of a freak-out to almost set the hotel room on fire! Hmmm...makes you wonder about the alarm system if nobody showed up to see what was going on! Hope the rest of your stay was uneventful and that you make it safely home. Nothing like a little excitement! Hope you got some sleep. 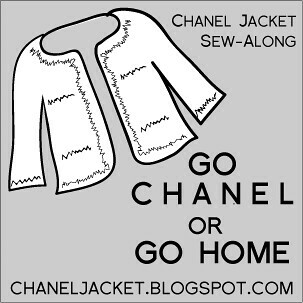 You look great in a capelet! It adds some fun to an all black outfit. I think that you are on to something! What a stylish fashion forward number! You could give the ANTM models some hints on dressing like a model .. Tyra has a real bee in her bonnet about that .. "you just don't look like a model," is one of her favourite comments. I remember that first hear of the winter... my house always smelled like hot dust, but I don't remember setting off the fire alarm. =) The capelet is adorable!! Thanks for the laugh! That must have been one sensitive smoke alarm!!! Hope you got enough sleep!!! Training on no sleep is no fun at all! @mjb - I took photos of the capelet over a strapless black dress, but the lighting that day was pretty bad. Thanks for mentioning -- I will try again and see if I can post more pics. @Becky - Thanks! The studs are literally "English 77" studs, which I guess are the exact style from the late 70's punk movement. 'Cause there are about a zillion styles of studs! @Cindy - I did sleep, for only 6 hours. I was ready to pass out by 6 the next evening. :) Thanks. @Violet - LOL No, I avoided the sidewalk scene entirely, thank goodness! @Christy - See? You knew right off what that smell was. I thought it must be burning wire. Silly me. @glam.spoon - Snaps rule if you can get them installed right! @Kyle - I don't think there was any visible smoke, so I suspect you're right that it was very sensitive. Then part of me wonders if the alarm has limited use if no one else responds but the person in the room...? Thank you so dang much for the snap setting confessions--I thought it was just me and some sort of sign that I'm not meant to use snaps. Like a bad snap omen or something. I'm always glad to hear what people can't do. And yes, I also think the capelet is really nifty. Makes me want to make one out of vintage polyester. Antoinette - you are really showing your creativity and style with this one. I love it. Love the capelet! I'm glad you didn't get hurt or had people come banging on your door about the smoke and alarm. 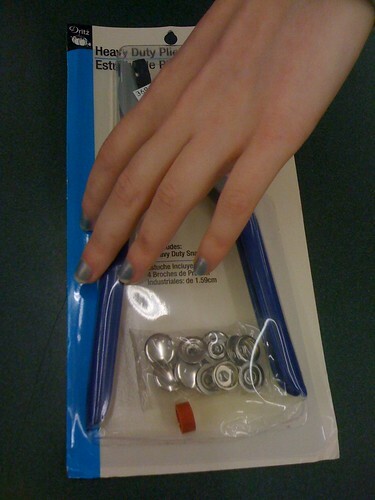 @ginger - I believe it is mechanically IMPOSSIBLE to properly set a jumbo snap using the attachment included in the "convertible" Dritz pliers. 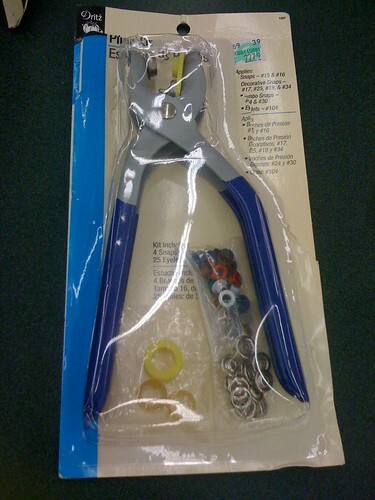 And I even find the "right" Dritz pliers to be counter-intuitive! @Gail - Thank you -- that really means a lot to me! @NGLaLaLa - Thanks, and I'm glad, too! I did have to evacuate once from the 26th floor of a Canadian hotel at 5:30 a.m. So grateful this one didn't turn out the same. Oh my. How I love this. Would adore a tutorial--so tough and stylish! i. want. one. that is the coolest capelet i've ever seen. it changes up your outfit entirely! totally awesome! Your blog is really inspiring!